Ellis & Shirley Fourman opened the doors to Fourman's Furniture in 1981 with honesty and integrity as the cornerstone upon which they built their business. Their goal was simple... "sell quality furniture, at great prices, with great service". In 1995, the Lane family, Bill Lane Sr. and Bill Lane Jr., formed a partnership and purchased the business with the intention of continuing the tradition Ellis and Shirley started fifteen years earlier. The store has gone through some changes including a new location, remodeling, and a name change to Gallery Home Furnishing, but the thing that hasn't changed is the way Ellis & Shirley always conducted business... with a hand shake and a smile. Shop Gallery Home Furnishings and you will find this still rings true today. Fashionable Furniture, great prices, and friendly people always eager to help. The team at Gallery Home Furnishings is proud to have created an atmosphere of trust and personal service providing you with a no-pressure, enjoyable place to shop. We know shopping for your home can sometimes be difficult and confusing. Be confident our non-commissioned staff is always eager to help you select the perfect piece of furniture, home decor item, or the "right" mattress for your best night's sleep. If needed, we are happy to provide In-Home decorating services creating the perfect space reflecting your individual taste and style. Don't let our small town location fool you. We invite you to shop Gallery Home Furnishings before you buy anywhere else. At Gallery Home Furnishings you will always find the nation's best furniture, home decor, and mattress brands, great prices, and friendly people always eager to help. 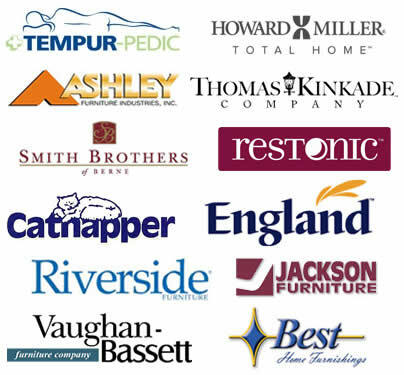 We are proud to sell products from the nation's best furniture, home decor, and mattress brands including Smith Brothers of Berne, Ashley, England, Jackson, Best Home Furnishings, Catnapper, Samuel Lawrence, Riverside, Vaughan-Bassett, Thomas Kincade, Howard Miller, Restonic, and Tempur-Pedic..
Gallery Home Furnishings makes buying your new furniture or mattress easy with special financing options, many with extended terms and no interest. Ask your sales associate to customize a plan just for you. 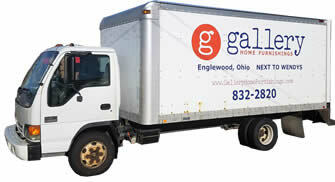 Be confident that deliveries from Gallery Home Furnishings are made on our own trucks by our own great people. We do not work through a “delivery service” which means greater flexibility and superior personal service for you! While our delivery crew is well experienced, it is still the customer’s responsibility to be sure delivery entryways are suitable to accommodate the furniture that you purchase, and walkways are free and clear of ice and snow.